Catching that calf in mid stride. Wow! I hate bathing horses. At least I did until I found a way to do it more efficiently. The part I hated the most was getting wet and having to scrub the soap on and then rinse it off. I found a solution. 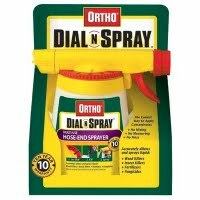 I purchased a garden hose sprayer like the one pictured. With this I simply add any shampoo or soap I choose. Then I turn the dial to the desired lather. If I am just doing an after ride spray off I usually set it to 1-2 T. Spoons per gallon, but if I want to really get a horse clean I will set it to 4 T. Spoons per gallon. You can play with the spray to set it where you need it, but I have found this really helps me at bath and cool down time. Gotta love live action pictures! 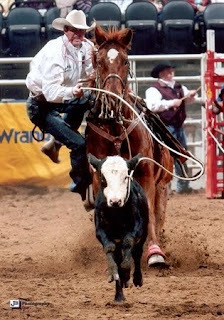 As I always say, the only you have to do in Breakaway Roping is get it around the neck. Yeah my kids love that advice! Revolutionary life-changing technology heals tissue at the cellular level and rebalances bio-electrical flow, reducing your body's time to heal by two-three times and in some cases heals chronic pain that has not healed in years. The Electro-Acuscope & Myopulse are sophisticated electronic medical instruments with an input-output (read/treat) mechanism. The low voltage micro-current allows healing of damaged neural and connective tissue. What makes the Acuscope & Myopulse instruments unique to other micro-current devices is that they are able to decipher abnormal tissue response and adjust the electrical output to produce a corrective current that normalizes or relaxes damaged tissue. The treatment is NON-INVASIVE and virtually painless. The body functions through low-voltage conductivity with different currents that flow through connective tissues including muscles, tendons, ligaments and bone as well as neurological and brain wave conductivity. When a human or animal becomes injured the body’s normal electrical conductivity becomes altered. Acuscope & Myopulse micro-current therapy is administered through various types of small therapeutic probes that offer a corrective signal that normalizes abnormalities with no discomfort or side effects. Do you ever worry about your horse drinking enough when you are on the road? How about if he is getting enough salt from the salt block at home? I always wondered this as well. So, what is the solution? 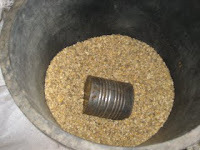 I found it is really easy, especially if you are feeding your horse any type of grain and/or supplement. The answer is to actually feed your horse salt. I offer my horses at home a salt block and add loose salt to their feed ration. However, on the road I only take the loose salt. I feed about 1-2 tablespoons of salt each feeding. This amount depends on the size of the horse, how much they are sweating, and how much they are drinking. You can ask your veterinarian for a recommendation. The salt I use is labeled for livestock and can be purchased quite inexpensively. This picture is of the salt I am currently feeding. It is a natural mineral salt, so it also supplies trace minerals. Plain table salt can also be used (I suggest the salt that is not iodized). If my horse is not drinking enough on the road I will often add a bit of salt to the ration. The amount of water a horse drinks is directly related to the amount of salt a horse eats. I have found adding salt to the grain has been a great way to keep my horses healthier on the road and at home. This loose salt is convenient to haul. I put it in a small tupperware like container with a measuring spoon. 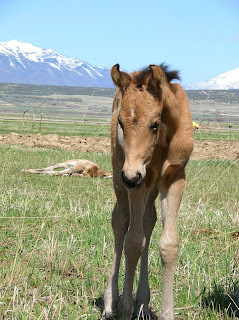 If you are like me anything that will help keep my horse healthy and help prevent colic is a great investment. I hope this tip will help you out on the rodeo road. The other day I was sitting at a football game. Our team intercepted a pass and made a run for the end zone. He almost made a touchdown. The thing that stopped him was he looked back to see if there was someone trying to tackle him. When he looked back he slowed down and sure enough the guy that was on his heels was given the opportunity to tackle him. As I sat in the stands and reflected on it. I realized that looking back in any sport will slow you down. DON'T LOOK BACK!! If you are running poles, barrels, football touchdowns...what ever it is. DON'T LOOK BACK. Just the act of turning your head (and consequently your shoulders) slows you down. I have seen girls running poles look back to see if they knocked one over and slow down and then loose the coveted first place finish. DON'T LOOK BACK. It is alot easier to say then to implement, but if you practice that way it will be easier to do at the rodeo or football game or in life. Bail off my horse and run to the goat. Grab the ribbon and run! 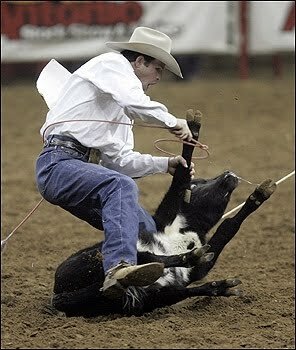 This is an example of rodeo being a lifestyle not just a sport. My husband left town for the weekend and left me and boys home to care for our small farm. He hadn't been gone more than 6 hours when everything started to fall apart. The boys had some friends over and they were roping and tying goats and being boys. Pretty soon I hear a huge commotion outside and went to see that my husbands big rope horse was out tromping on my grass and through my garden. 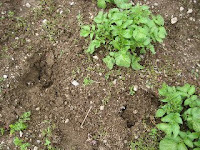 This was an even bigger problem since it had just rained making the ground really soft now I have big hoof prints in my grass and through my garden. I think most of the vegetables survived however, the carrots did not. After getting the horse put away and things taken care of I went in to fix dinner. The boys were feeding animals and playing. I fed the kids and then went out to check on the animals and make sure everything was OK only to find that the steers and the appaloosa pony had changed corrals and the pony was cleaning up the grain from the show steer. 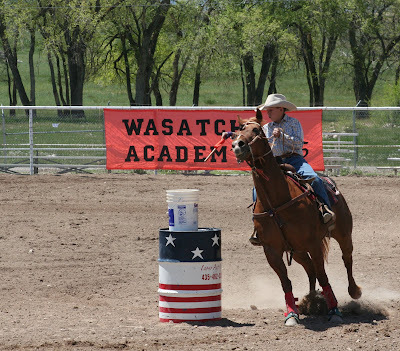 Huge problem and this is where if you are a new rodeo mom you need to pay close attention. 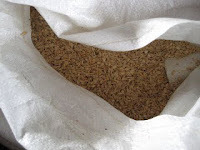 There are ingredients in the show steer grain that can be very harmful to horses. So I panic start yelling for help and moving animals. The other problem that can be very deadly for the show steers is they were cleaning up the horses hay. Too much leafy alfa will make steers bloat. Lesson number one is to make sure you know what feed goes to which animals. This can save you more heart ache down the road The small bales stacked to the ceiling are horse hay they are grass alfalfa the large bales on the sides in front are oat hay for the show steers. 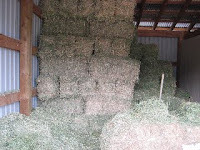 This is very important to know because the hay for the show steers is not good for the horses and the other way around. 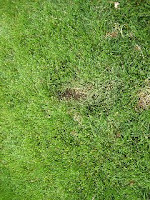 This photo is the show steer grain if you look closely it has a lot to it. The photo on the right is just oats for horses. Even though both grains are similar it is very important to make sure you are feeding the right grain to the right animals. This can be a little overwhelming but just make sure everything has a place and container and then label them if you need to. This will help everyone stay on the same page you can even label the containers with the names of which animals they go to and on that label list how much they get how many times per day. Some older horses get joint supplement and conditioners where the younger horses get different supplements. 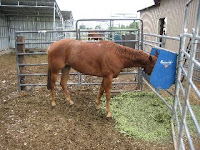 What ever it is make sure things are labeled and safe for which horse or animal you are feeding. The rest of the evening was uneventful how ever the next day turned out to be as eventful I will save that story for another post but concluded with the next night before going to bed, I made the rounds and found all of the animals properly fed and safely tucked in. 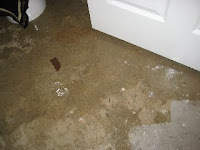 The kids were bathing and getting ready for bed when we discovered the basement had flooded. With all of the rains from the week the floor drains in my basement back filled leaving me a mess. So lesson number two as much as you love to have a break from those rodeo dads it really isn’t worth it if you are the one staying home. So next time I am leaving and my husband is staying home. Eating toxic foods every day will sap your energy and eventually kill you. Associating with toxic people will have the same effect on your emotional well being. A couple of weeks ago, we were practicing roping in the afternoon. 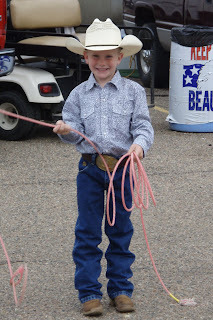 My son who is 14 has been roping for almost 5 years now. He was riding a 6 year old mare. Since our head horse is lame, we need to get a new one finished right away. He has been working on her for about a year and she knows the basics but needs to get ready for competition. The one area that we really need to focus on is the box. We have all rode her in an out of the box dozens of times. However, every once in awhile she has a problem with coming out. She balks instead of moving forward. Well he had roped the first couple of steers really well. She had came out of the box right in position and pulled the steers well. About steer number 4 is when the trouble began. She backed in the box but kept going backwards and getting deep into the corner. I was just outside the box and my husband was on the other side opening the chute. He started to really get after her with a spur. I told him to mellow out. Then my husband opened the chute and she wouldn't start. So he really got after her. This time she panicked. She did not know how to get away from him. So she started to slam into the back of the box to try and back away. She came up slightly so the first couple of times she hit is back against the metal rail. When that didn't work she slammed against the side of the box with his leg pinned between her and the metal bar. We told him to stop and resisted the urge to jump in there. She settled down and we went in to help him off. The reminder is that sometimes you can make a situation a lot worse by jumping in the middle. If my husband or I had jumped in the box with the mare, she would have panicked worse. It was possible she could have made it all the way over. Then we would have really been in trouble if my son had been under a 1200 lb horse in the box. We let her settle and jumped in when it was safe for both of them. Remember don't run up on a panicked horse. Look for other ways to resolve the situation. Luckily, nothing was broken. My son had to use some crutches for a few days for a smashed foot. Of course the mare has had a lot of education about the box and balking in general. We also made sure to teach my son that there are other ways to resolve balking than a spur. Young kids and young horses just don't understand each other sometimes. Didn't your mom ever tell you not to run with a stick in your hand? Flag racing is really amazing to me when those boys are running as fast they can. With times in the 7 to 9 second range, they are really flying.